We purchase and eat a good deal of frozen vegetables in our home. Typically, we buy the two pound bag, and prepare just enough for one meal at a time. I always had a tough time finding the specific bag I wanted from the grocery store since the different varieties looked similar (and my freezer was stuffed full). 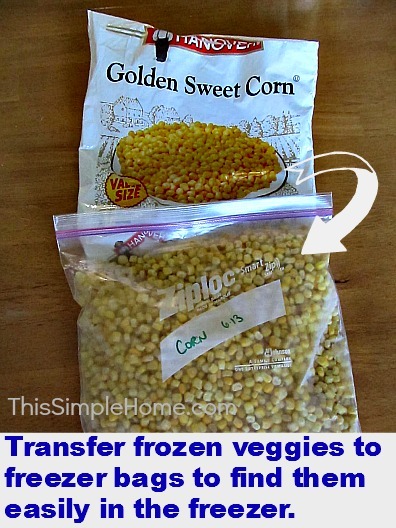 For years I knew that the veggies I blanched and froze myself were easier to find since I could see through the clear zippered bag. But it took years for me to figure out that I could transfer my store-bought frozen vegetables to zipper bags to make the guess work of finding the right veggie easier. It's amazing. We now have an upright freezer in addition to our side-by-side fridge/freezer in the kitchen, but our freezers are always so full and messy! This month, I am actually working to use a lot of the food in our kitchen's freezer, especially the already prepared foods (breads, biscuits, rolls, meals, muffins). Cookies freeze beautifully, but we typically eat those within a couple of weeks. I have also been purposeful this year to purchase meats only every couple of months (when they are on sale) so I intentionally use the meats we have on hand instead of just storing more of the same in the freezer. I not only purchase meat and vegetables for the freezer, but I also prepare an occasional prepared meal to put in the freezer. (This is simply done by adding a few extra pieces of meat when preparing a meal or making an extra large batch of macaroni and cheese.) I cook smooth spaghetti sauce and pizza sauce in large batches and place in the freezer, as well as homemade applesauce to freeze. In both of my freezers, I use bins to sort foods. In the upright deep freezer, the labels are Pork, Beef, Chicken, Prepared Foods, and Fruits/Vegetables. In my kitchen's freezer I should label, but don't. Instead, I have fruits, vegetables, prepared meats, and raw meats. By purchasing meat only on sale-and using it- I am able to save a good deal of money. I just need to be diligent about letting the meat thaw completely before cooking it. Do you use your freezer or do you cook from mostly fresh foods? Great idea about organizing the foods based on type. I really need to do that. We just have stuff tossed in ours all haphazard. It does make finding this difficult and I am alwas forgetting about things that get buried down in the bottom. Thanks for the tips! Meredith, I just bought cheap,plastic tubs. If you want to label them (important for me), create your labels and put them on the bins BEFORE you freeze them. They don't stick well on frozen items. I love the idea of putting the store vegetables in my own bags so they don't get lost. I need to work on getting our freezer stocked (with useable meals rather than junk) before the business of the school year arrives. I've figured out I don't remember most of the meats I freeze, and when we moved (ages ago, like 9 years), ended up throwing away large amounts of food I'd bought on sale and forgotten was in there. It was so sad. Also says he can tell the difference in meat that's been frozen and meat that hasn't.